Drallim Industries is a leading innovator in design and manufacturing solutions in support of MRO (maintenance, repair and overhaul) organisations, providing engineering skills, manufactured equipment & custom-built systems to exact bespoke requirements. 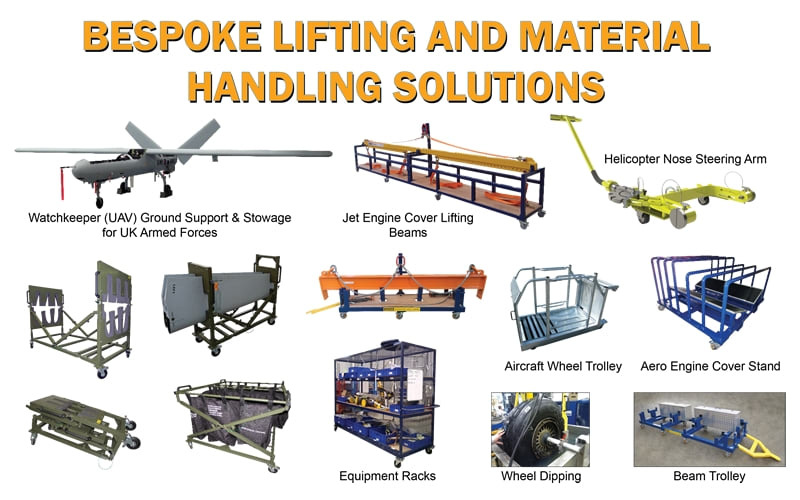 We partner with both military and civil aviation customers to develop and implement fresh solutions that range from simple tooling to trollies, trailers, lifting and material handling platforms. Our highly skilled staff specialise in solving the sort of engineering and manufacturing conundrums you’d rather be without. Our organisation is geared to producing one-offs and we can work from a sample, site survey and the simplest of client briefs. We take pride in overseeing the entire process, from design and manufacture to delivery, installation and after-sales service. Wheel management solutions include tyre/ wheel trolleys, trailers, custom chocks, restraints, test cages, and wheel spray tables. If it involves wheels we can provide a solution. 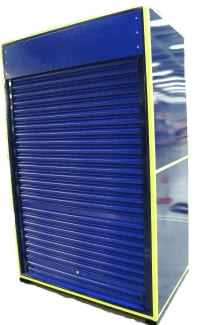 Drallim have often been approached to make bespoke equipment for the MRO area. We have a proven track record to successfully deliver specialist tools. We have produced a wide range of cables including gearbox, clutch, throttle, handbrake and door release cables. Our design team are here to work with you through the development of your cable if you require, or we could simply manufacture to your drawing and / or specifications; whether the part is unique or has been discontinued. Our pledge at Drallim Industries Ltd is to provide the ultimate service to our clients, providing high quality cables and rods that conform to the specifications as set out by commercial, military and aerospace regulations, thus completely satisfying the needs and requirements of all our clients. The trolley seen above was designed to transport aircraft wheels and is tailored to handle sizes ranging from Boeing 737/Airbus A320 size up to 777 and A380. Manufactured from light-weight aluminium and fitted with four steering castors the trolley is easy to manoeuvre across hard standings in most conditions. The design and manufacture of bespoke trollies and trailers has become a mainstream business for Drallim. We have amassed a lot of experience supplying material handling solutions that cater for the manoeuvring of large and heavy items in a safe and controlled manner. 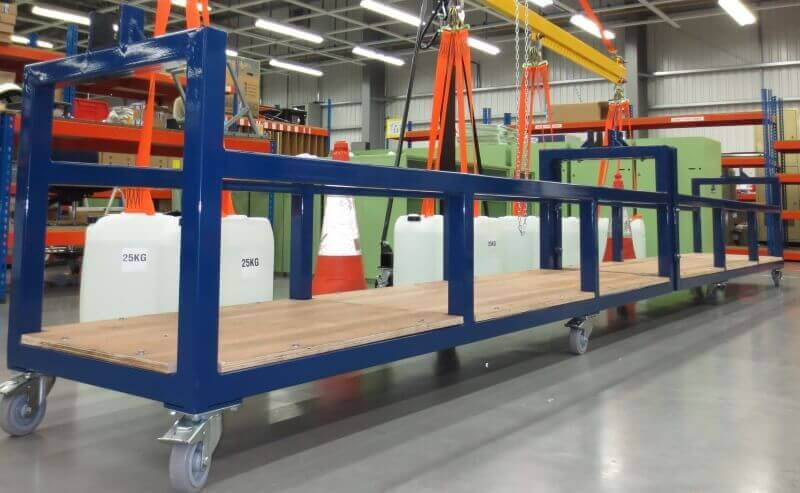 Examples typically include trolleys for handling Engine lifting beams, Engine stands, Aircraft wheels and Storage containers. 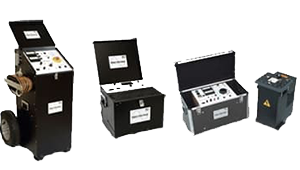 In each case designs will be specific to your needs and there is no limitation on size or load carrying capabilities. The example seen above shows a trolley for a Trent 700 lifting beam. 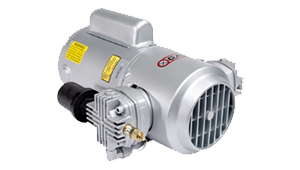 Drallim Industries supplies various portable equipment racks for secure stowage of parts removed from engines and similar assemblies during periods of maintenance and overhaul. Equipment racks can be designed and manufactured to meet your specific requirements with any combination of shelving and parts securing methods available. Our modern 1800 square metre production area and trained staff have all the necessary skills and production capabilities to meet any requirements you might have from one off prototypes to full production runs. Our fully integrated Enterprise Resource Planning system (ERP) streamlines the processes from order entry and shop floor scheduling through to delivery. This gives us complete visibility and control allowing us to work efficiently and effectively. 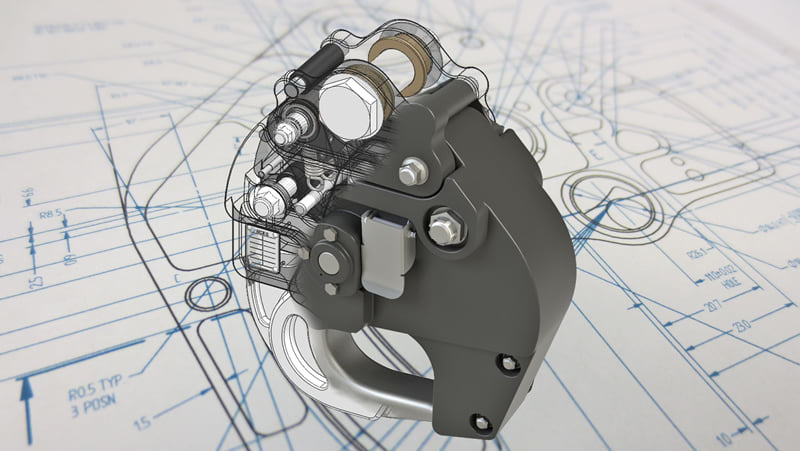 The expertise of our design and development department is frequently called upon to work directly with the customer and develop unique and cost-effective solutions, using the very latest developments in CAD/(Soildworks) and our inhouse 3d printer for rapid prototype modelling, providing a valuable, dependable service.